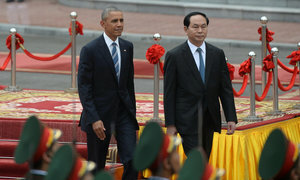 Obama discusses Vietnam-U.S. relations with Vietnam's intellectuals, civil society, entrepreneurs and students in Hanoi. 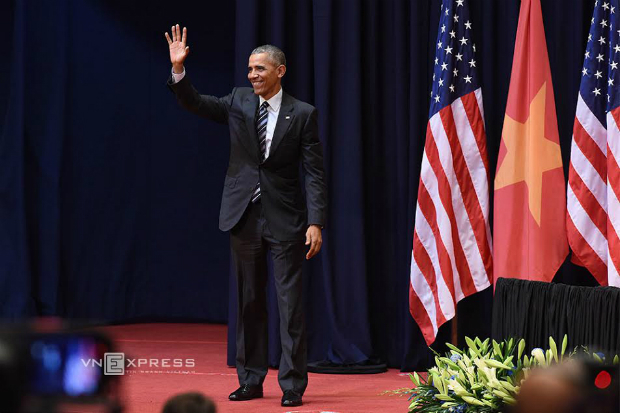 VnExpress International updates live Obama's talk with Vietnam's generation of the future. Xin chao. Xin chao Vietnam. Thank you. Thank you so much. To the government and the people of Vietnam, thank you for this very warm welcome and the hospitality you have shown me on this visit. And thank all of you for being here today. We have Vietnamese from across this great country, including so many young people who represent the dynamism, the talent and the hope of Vietnam. On this visit, my heart has been touched by the kindness for which the Vietnamese people are known for, and the many who have been lining the streets, smiling and waving, I feel the friendship between our peoples. Last night I visited the Old Quarter here in Hanoi, and enjoyed some outstanding Vietnamese food; tried some bun cha, drank some Beer Hanoi. But I have to say the busy streets of this city, I have never seen so many motorbikes in my life. So I haven’t had to try to cross the street so far, but maybe when I come back and visit, you can tell me how. 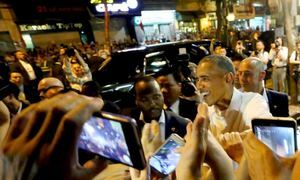 I am not the first American president to come to Vietnam in recent times, but I am the first, like so many of you, that came of age after the war between our countries. When the last U.S. forces left Vietnam, I was just 13 years old, so my first exposure to Vietnam and the Vietnamese people came when I was growing up in Hawaii, with its proud American Vietnamese community there. At the same time, many people in this country are much younger than me. Like my two daughters, many of you have lived your whole lives knowing only one thing at that is peace and normalized relations between Vietnam and the United States. So I come here mindful of the past, mindful of our difficult history, but focused on the future. The prosperity, security and human dignity that we can advance together. I also come here with a deep respect for Vietnam’s ancient heritage. For millennia, farmers have tended these lands. History revealed in the Dong Son drums. At this bend in the river Hanoi has endured for more than a 1000 years. The world came to treasure Vietnamese silks and paintings, and the great Temple of Literature stands as a testament to your pursuit of knowledge. And yet over the centuries your fate was often dictated by others. Your beloved land was not always your own. But like bamboo, the unbroken spirit of the Vietnamese people was captured by Ly Thuong Kiet, the southern emperor rules the southern land, our destiny is writ in heaven’s book. Today we also remember the longer history between Vietnamese and Americans that is too often overlooked. More than 200 years ago when one of our founding fathers Thomas Jefferson sought rice for his farm he looked to the rice of Vietnam, which he said had the reputation of being whitest to the eye, best flavor to the taste and most productive. Soon after, American trade ships arrived in your ports seeking commerce. During the Second World War, Americans came here to support your struggle against occupation. When American pilots were shot down, the Vietnamese people helped rescue them. And on the day Vietnam declared its independence, crowds took to the streets of this city, and Ho Chi Minh evoked the American Declaration of Independence. He said all people are created equal. The creator has endowed them with the enviable rights, among these rights are the right to life, to liberty, and the right to pursue happiness. In another time, the possession of these same ideals and a common story of throwing off colonialism might have brought us closer together sooner, but instead cold war rivalries and fears of communism pulled us into conflict. Young people participating in Obama's talk. Photo by VnExpress/GiangHuy. Like other conflicts throughout human history, war, no matter what our intentions may be, brings suffering and tragedy. At your war memorial nor far from here and with family alters across this country you remember some 3 million Vietnamese, both soldiers and civilians, who lost their lives on both sides. On our memorial in Washington, you can touch the names of 58,315 Americans who gave their lives in the conflict. In both our countries, our veterans and families of the fallen still ache for the loved ones they lost. Just as we learned in America that even if we disagree about a war we must always honor those who served and welcome them home with the respect they deserve. We can join together today, both Vietnamese and Americans, and acknowledge the pain and the sacrifices on both sides. 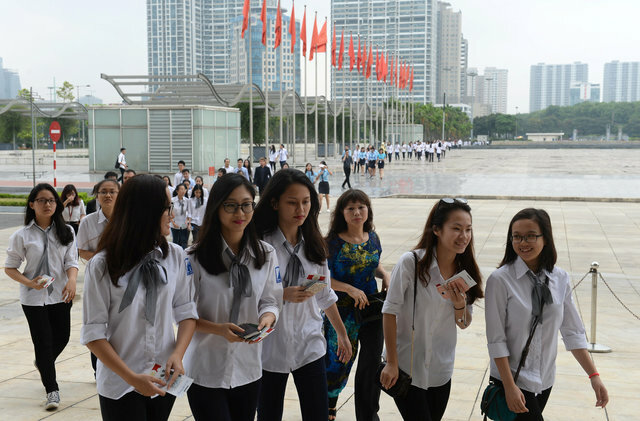 More recently over the past two decades, Vietnam has achieved enormous progress, and today the world can see the strides that you have made. With economic reforms and trade agreements, including with the United States, you have entered the global economy selling your goods around the world. More foreign investment is coming in, and with one of the fastest growing economies in Asia, Vietnam has moved up to become a middle income nation. We see Vietnam’s progress in the high-rises in the skyscrapers in Hanoi and Ho Chi Minh City; new shopping malls and urban centers. We see it in the satellites Vietnam puts into space, and a new generation that is online, launching start ups and running new ventures. We see it in the tens of millions of Vietnamese connected on Facebook and Instagram. And you're not just posting selfies, although I hear you do that a lot, and so far there have been a number of people who have asked me for selfies. You’re also raising your voices for causes you care about like saving the old trees of Hanoi. So all this dynamism has delivered real progress in people’s lives. Here in Vietnam you’ve dramatically reduced extreme poverty, you’ve boosted family incomes and lifted millions into a fast-growing middle class. Hunger, disease, child and maternal mortality are all down. The number of people with clean drinking water and electricity; the number of boys and girls in school, and your literacy rate: these are all up. This is extraordinary progress; this is what you have been able to achieve in a very short time. 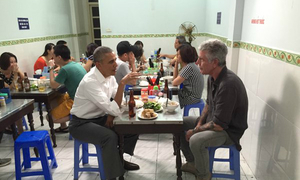 As Vietnam has transformed, so has the relationship between our two nations. We learnt a lesson taught by the Venerable Thich Nhat Hanh, who said: in true dialogue both sides are willing to change. In this case the very war that divided us became a source for healing. It allows us to account for the missing, and finally bring them home. It allowed us to help remove landmines and unexploded bombs because no child should ever lose a leg just playing outside. Even as we continue to assist Vietnamese with disabilities, including children, we are also continuing to help remove Agent Orange so that Vietnam can reclaim more of your land. We’re proud of our work in Danang and look forward to supporting your efforts in Bien Hoa. Keep working to unleash potential of your economy with TPP. TPP will help you sell more of your products to the world. The U.S. can help Vietnam improve labor conditions. I support TPP. It will help you buy more goods from us. 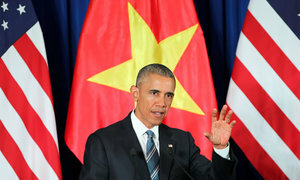 Vietnam will be less dependent on just one trading partner. TPP will reinforce regional cooperation. 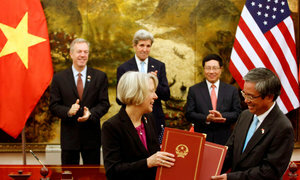 The TPP addresses economic inequality, improve human rights, wages, labor conditions, prohibitions against child labor. We agreed to build more trust, to offer training and equipment maritime humanitarian aid, to lift the embargo on sales of lethal arms. 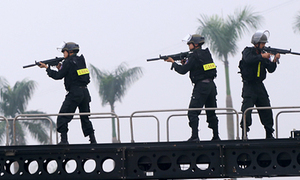 Vietnam now can have more access to military equipment to improve security. We have fully normalized our relations over the past 20 years. The government will be committed to economic and legal reforms under the TPP. The future of Vietnam is decided by the Vietnamese people. 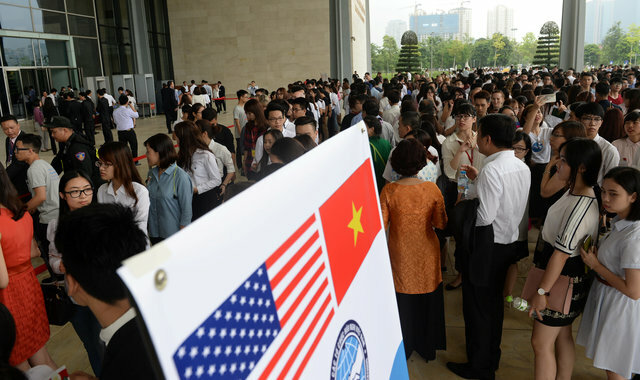 People attending Obama's talk in Hanoi. Photo by VnExpress/GiangHuy. Our partnership can meet global challenges that no nation can solve by itself. If we want to ensure the health of our people, the beauty of our planet, then development has to be sustainable. Nature wonders like Ha Long bay, Son Doong cave have to be preserved for our children, our grandchildren. With rising seal level, as climate change partners, we need to commit to the Paris agreement to adapt to bring more clean energy, to protect the Mekong Delta, the rice bowl of the world. We need to save lives by helping to improve the health system, prevent disease by helping improve health system, prevent disease Vietnam committed to UN peace keeping. US is ready to help Vietnam train. Vietnam committed to un peace keeping, US ready to help Vietnam train in addition to bilateral in addition to bilateral rel our partnership helps shape internaitonal environment. Two centuries have gone, The U.S is still struggling with our own founding ideas. Too much money in politics, inequality, racial bias, women are not paid as much as men when doing the same job. We still have problems. I am not immune to criticism that I promise I hear everyday. That scrutiny helps us find our own imperfection, allow all to have their say The US doesn't seek to impose our form on the government of Vietnam. Economies need to thrive, that’s where new ideas happen. How facebook started was because somebody had a new idea that was different and could share it. When free press that hold official accountable and build public trust. When voters can choose their own leaders it will lead to stable. Freedom of religion means fully express love and compassion, allows faith schools to care for community. Freedom of assembly means countries can better address challenges that the government cannot solve by itself. Upholding these rights is upholding stability inspired people around the world to remove colonialism. Nations that proclaims to be by the people, for the people. Vietnam will do it differently from the U.S., but there are these basic principles that I think we all try to work on to improve. It’s from somebody who’s going to leave office, so I had lots of experience, traveling around the world. 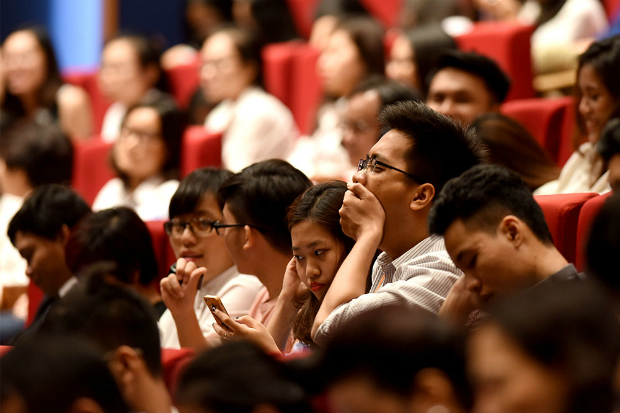 It's an issue of all of us trying to apply these principles making sure that we, those in the government, are being true to these ideas In recent years, Vietnam has made some progress and is committed to bring law with constitution. The government will disclose more about its budget. Vietnam committed to economic and legal reforms under TPP. 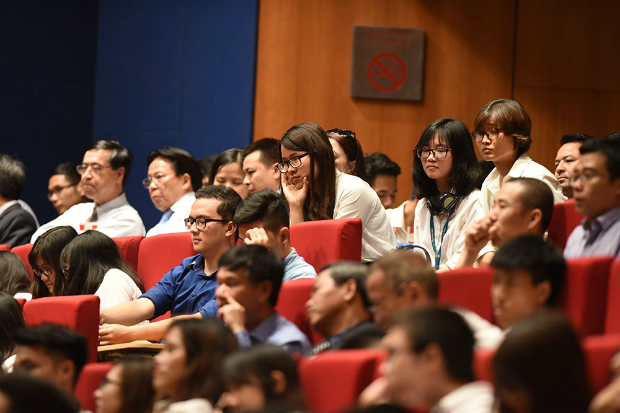 Future of Vietnam is decided by the people of Vietnam. Vietnam committed to UN peace keeping and US was ready to help Vietnam in training the staffs. In addition to bilateral relationship, our partnership helped shape international environment. This is not going to happen overnight. There may be some misunderstandings. This could take effort, dialogue from both sides to change. I am very optimistic about our future and I am confident in rooting in friendship and shared aspiration. I think of Vietnamese who crossed the ocean and some Vietnamese like Trinh Cong Son writing the song join hand, open heart and see humanity in each other. As a friend of Vietnam, allow me to share my view. All Vietnamese and Americans who have succeeded: doctors, journalists or public service. One of them who was born in Vietnam wrote a letter saying that he was very proud to be American and Vietnamese His personal passion is to improve life of Vietnamese people. There are so many young people here- who are ready to make their marks on the world. 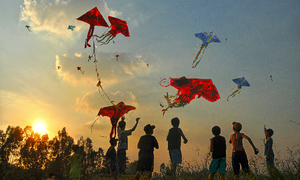 Your talent, drive, dreams and those things, Vietnam has everything to thrive. Your destiny is in your hands. 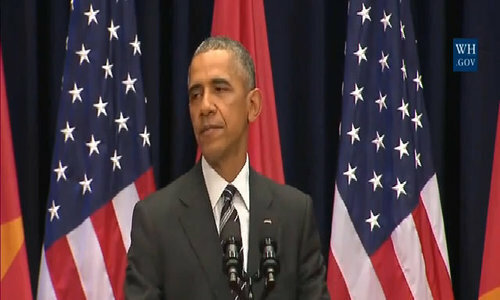 From this moment, the U.S is right here with you as your partner, as your friends. When freedom of speech and expression becomes fuel innovation. Please take from me the token of trust, so we can embark upon the 100 year journey together.